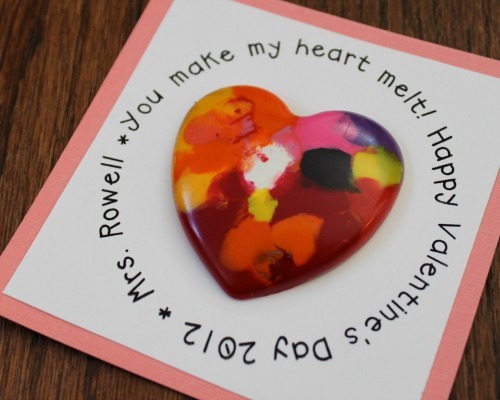 This Valentine’s Day card will not only make your teacher’s heart melt, it is also the perfect way to recycle old crayons. Check out Tenth Avenue South for the complete tutorial — but it is not as hard as it looks. Simply place the crayon pieces into a heart mold cookie tray and bake in the oven for 10 minutes. Check out their printable card template that reads, “You make my heart melt!” and glue onto card stock for the finishing touch. We love this idea for showing your child’s teacher that he or she totally rules. This would also be cute for class Valentine’s Day cards. 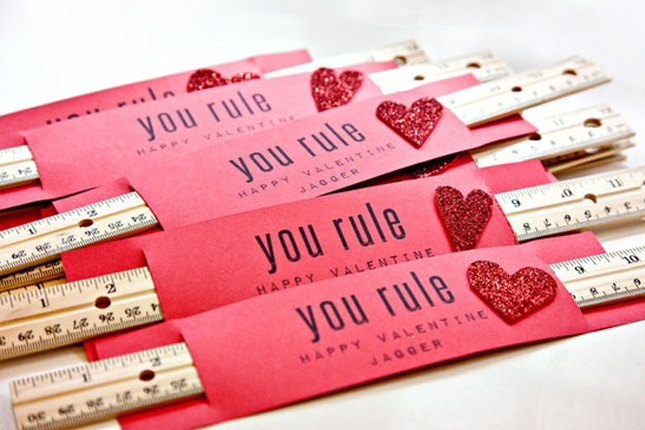 Simply pick up some vintage looking wood rulers (she found these at Target) and hop on over to Relocated Living for the free “You Rule” printable template and complete tutorial. This Valentine’s Day card is sure to be a hit because not only can you customize the message for your teacher, but she will love that it is also a bookmark. Every time she uses this felt key bookmark, she will remember your child’s thoughtful gift. Go to Dandee-Designs for the complete tutorial. Every teacher would appreciate a nice bottle of yummy-smelling hand soap. 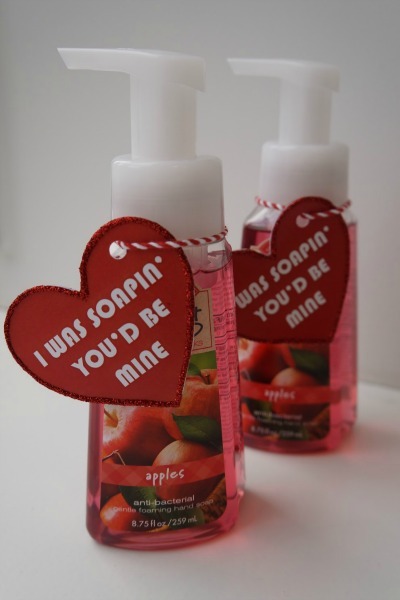 Print out “I was soapin’ you’d be mine” or “I was soapin’ you’d be my teacher” (or have your child write it out with a metallic paint pen) on a piece of red stock paper, cut the paper into the shape of a heart and affix it to a soap bottle. Have your child write a personalized message on the back. This is perfect for the teacher that always brightens up your child’s day. Simply place Starburst candies in a jewelry-sized baggy. 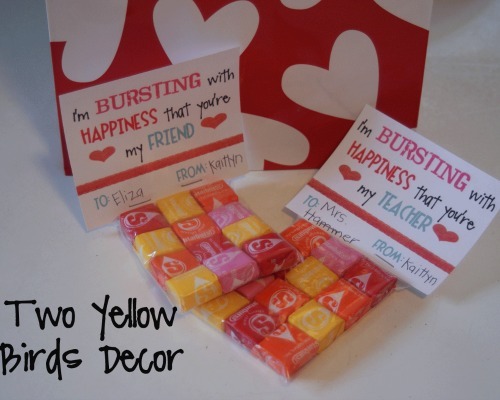 Head on over to Two Yellow Birds Decor for the complete tutorial and to print out her free tag that says, “I’m bursting with happiness that you’re my teacher.” Staple the note to the top, hand it to the teacher and watch for the smile. This card is great for the teacher who did such an amazing job with helping your child learn the ABC’s or how to read. Pick up some neutral color card stock and print out this free template, courtesy of Oopsey Daisy Blog. She has many types of colors for you to choose from. 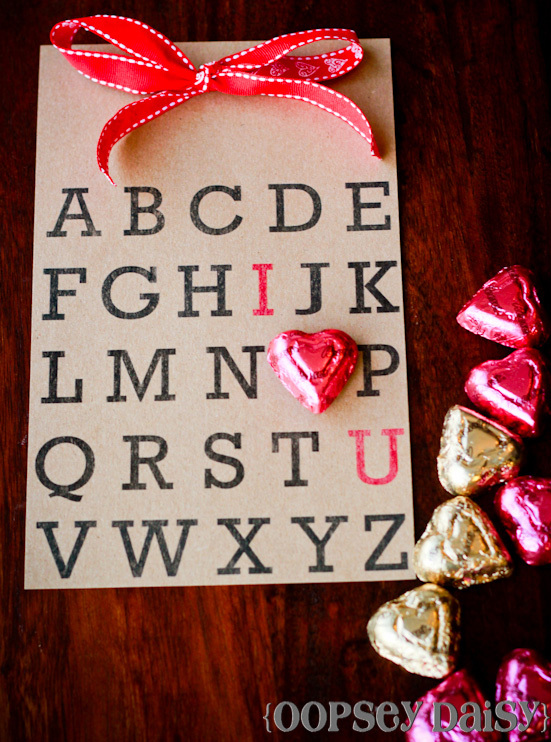 Embellish your card with ribbon and glue a chocolate heart over the O. 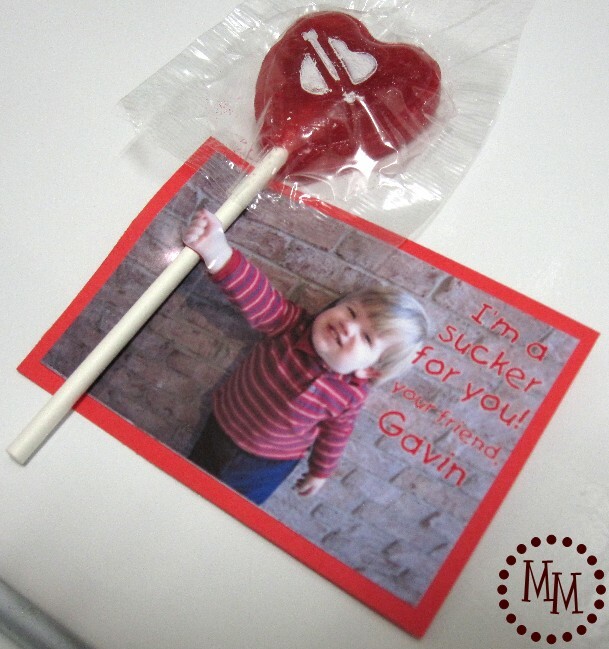 Have your child personalize the back of the card with a sweet message. Next Up: “Donut” you know? 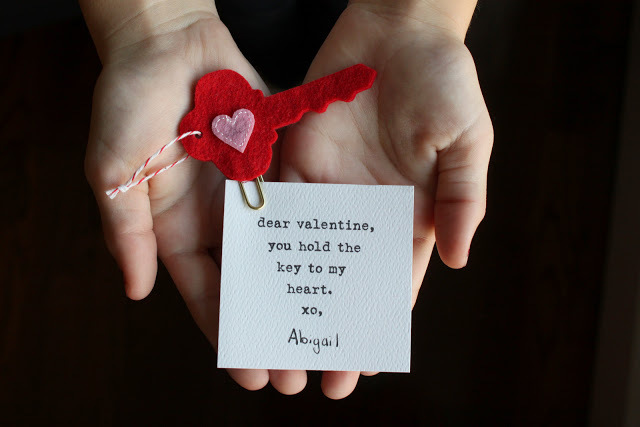 We love the play on words on this clever Valentine’s Day card. Plus, who doesn’t love doughnuts? 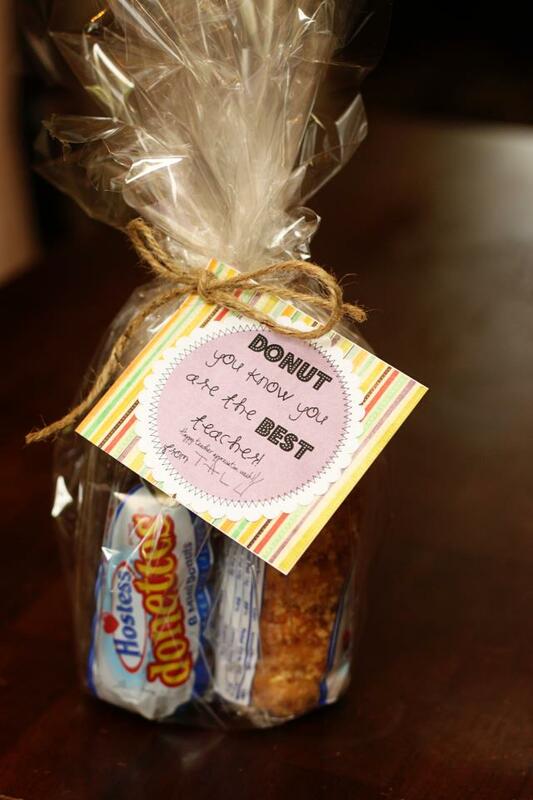 Head on over to SistersWhat.com to print out the free template that reads, “Donut you know you are the best teacher!” and attach it to a package of doughnuts. You can print it out on red card stock and cut it in the shape of a heart to make it even more Valentine’s Day inspired. This would not only be a great card for the teacher — but also for the entire class. Check out Dandee-Designs for the tutorial, however, she used a simple braid to create multicolored friendship bracelets. 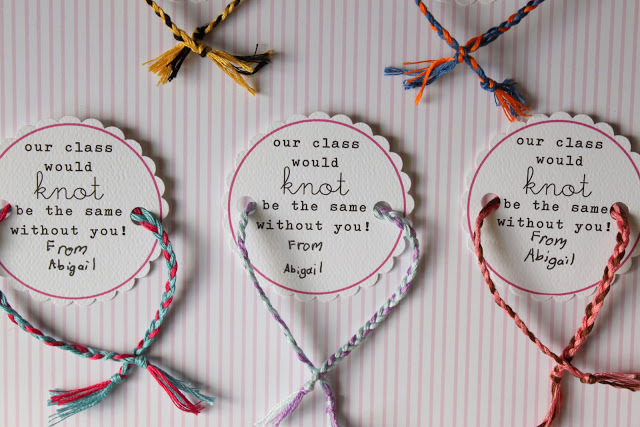 You can download and print the tag that reads, “Our class would knot be the same without you!” and use a scalloped paper punch to thread the bracelet through the card. What a cute keepsake for the year. 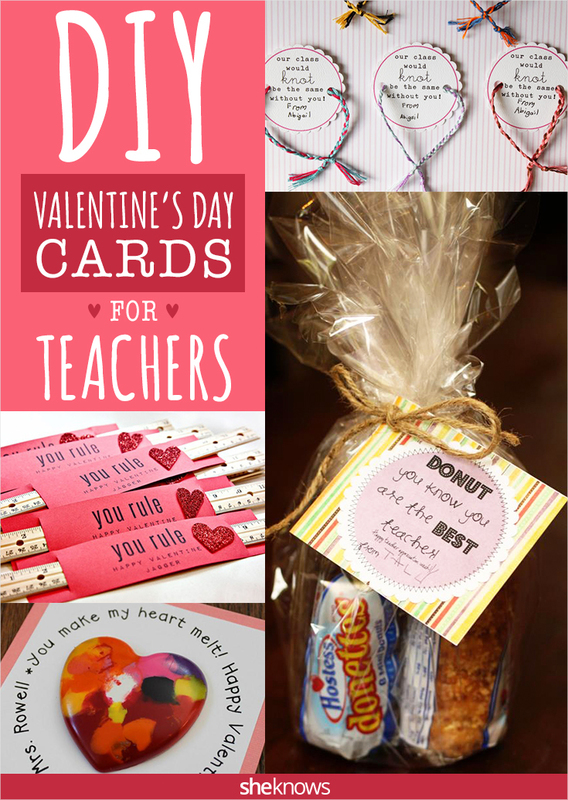 This is such a cute idea for teacher cards and for the class cards. Take a photo of your child with his or her hand outstretched and print them out. Insert a sucker through the hand and — voilà — it transforms into a 3-D card. Have your child personalize the card on the back to let the teacher know why he loves being a student in her class. This card is great for a favorite science teacher. 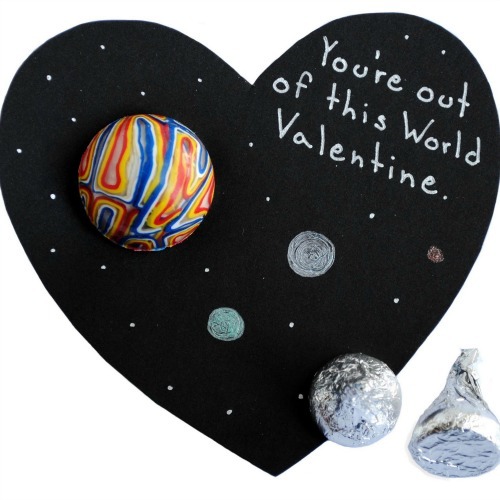 Using black card stock, a metallic gel pen and a colorful rubber ball, turn your Valentine’s Day card into a cool solar system. Check out Zakkalife for the complete tutorial.